“I have always been attracted to Night paintings by a variety of historical artists. Our family home had a Casson canvas of a farmhouse with a few internal lights on in the peace and quiet of the grey evening light. 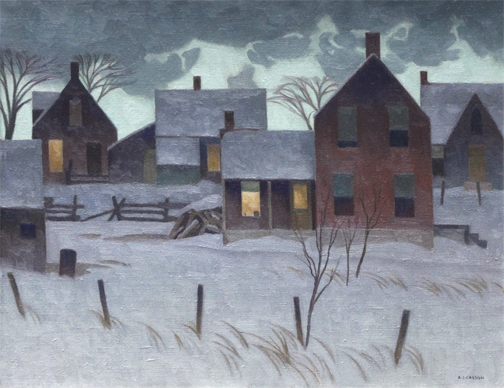 Jean Paul Lemieux, Will Ogilvie, Albert Robinson, William Winter and Jack Bush are others who regularly depicted the beauty of soft Night light. I had wanted for the past 10 years or so to have an exhibition of Night paintings. I would occasionally introduce the idea to some of our contemporary artists to get their reaction and was thrilled that the idea appealed to them as much as it did to me. Robert McInnis, Richard Montpetit and Jeannette Perreault were three of our artists who would regularly send us work of this nature.